A tiny piece of the building blocks from which comets formed has been discovered inside a primitive meteorite. The discovery by a Carnegie Institution of Science-led team, including a researcher now at Arizona State University, was published April 15 in Nature Astronomy. By studying a meteorite’s chemistry and mineralogy, researchers such as the paper’s lead author, Carnegie’s Larry Nittler, can unlock details about its formation and how much heating and other chemical processing it experienced during the solar system’s formative years. 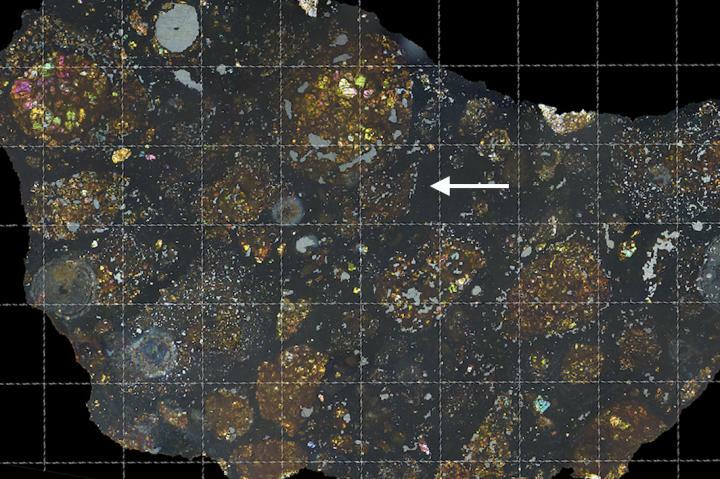 Inside the LaPaz meteorite, Nittler’s team found a very carbon-rich slice of primitive material. It bears some striking similarities to extraterrestrial dust particles that are thought to have originated in comets that formed near the solar system’s outer edges. Approximately 3 to 3.5 million years after the solar system formed, but while Earth was still growing, this tiny object — about one tenth of a millimeter across — was captured by the growing asteroid from which the meteorite originated. By undertaking sophisticated chemical and isotopic analysis of the material, Nittler and his colleagues — who besides Davidson include Carnegie’s Conel Alexander as well as Rhonda Stroud and Bradley De Gregorio of the U.S. Naval Research Laboratory, and Josep Trigo-Rodríguez, Carles Moyano-Cambero, and Safoura Tanbakouei of the Institute of Space Sciences in Barcelona, Catalonia — were able to show that the encased material likely originated in the icy outer solar system along with objects from the Kuiper Belt, where many comets originate. The existence of this primitive material captured inside the meteorite suggests that due to the drag caused by the surrounding gas, particles like it migrated from the outer edges of the solar system, where comets and Kuiper Belt objects formed, to the closer-in area beyond Jupiter, where the carbonaceous chondrites formed. This reveals details about how our solar system’s architecture took shape during the early stages of planet formation.